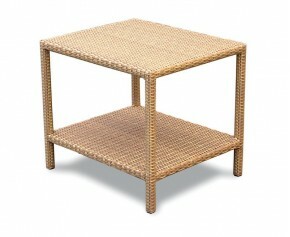 Classically stylish and elegant, this beautifully crafted Riviera rattan garden side table offers more than just practicality; it creates a wonderful design centre piece in any outdoor or indoor setting and has been built to last, highlighting our brilliant value for money. 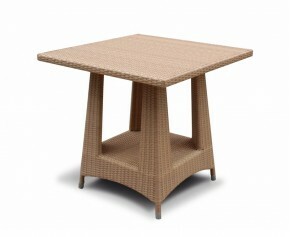 A garden favourite, this rattan dining table has the natural look and feel of rattan but offers greater durability. 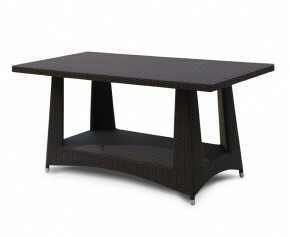 Modestly sized to suit most outdoor settings, this rattan dining table creates a wonderful focal point when paired up with our garden furniture and is equally suitable for both indoor and outdoor use. 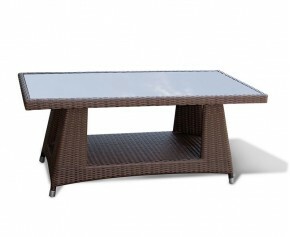 Classically stylish yet durable, this beautifully crafted Riviera all weather wicker 4ft coffee table offers more than just practicality; it creates a wonderful design centre piece in any outdoor or indoor setting and has been built to last, highlighting our brilliant value for money. 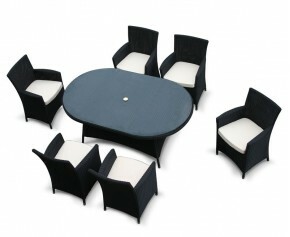 Ideal for larger outdoor areas, this Riviera 6 seat loom black rattan dining set will add a touch of sophistication to your outdoor setting and provides numerous of options for al fresco entertainment and dining. Expertly woven in synthetic Viro fibres over a sturdy yet lightweight aluminium frame. Our Riviera rectangular rattan dining table is crafted from Rehau Raucord® all-weather wicker woven over a sturdy yet lightweight aluminium frame, and is equally suitable for year-round indoor or outdoor use. This Riviera rectangular rattan dining table has the look and feel of natural rattan but offers greater durability and weather resistance. 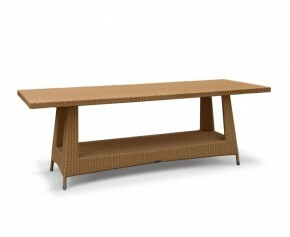 Crafted from Rehau Raucord® all-weather rattan, this rectangular rattan dining table is comfortable, stylish, practical and is equally suitable for indoor or year-round outdoor use. 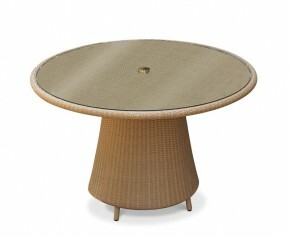 This Eclipse rattan glass-topped round table is crafted from Rehau Raucord® all-weather wicker woven over a sturdy yet lightweight aluminium frame - comfortable, stylish, practical and equally suitable for indoor or year-round outdoor use. 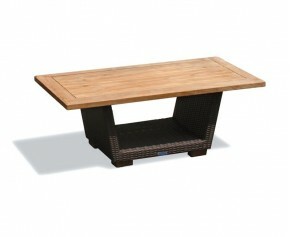 Our Riviera Java Weave rattan dining table has the natural look and feel of loom but offers greater durability. 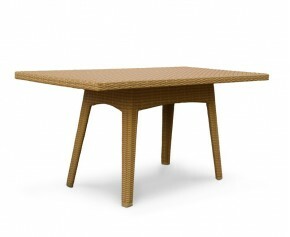 Woven with synthetic Rehau all weather wicker fibre over a sturdy yet lightweight aluminium frame, this rattan dining table is comfortable, stylish, practical and is equally suitable for indoor or year round outdoor use. Garden furniture can sometimes look hard and unfriendly, but with our outdoor rattan tables your garden can enjoy timeless luxury. Made using durable synthetic rattan, these 'soft to touch' wicker tables can remain outdoors all year round, ensuring trouble free pleasure. 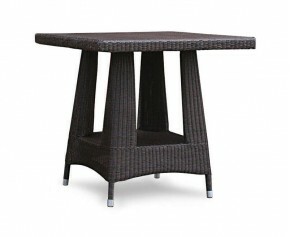 Choose from our range of rattan garden tables here.